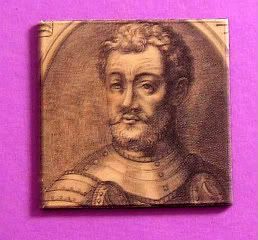 I had a different magnet in mind today, but once I found out that today in 1189, Richard the Lionheart was crowned king of England at Westminster Abbey, I knew it had to be this one. Before tonight, all I really knew was that Richard I didn't really bear resemblance to Sean Connery or Anthony Hopkins. Well, that, and that he's the son of Katharine Hepburn and Peter O'Toole, and the (quasi-related, but not really - the very definition of quasi, I guess) brother of Timothy Dalton. (A Lion in Winter, so good! Definitely check it out!) Or he's brother of Toby Stephens, depending on your taste in film or tv. He didn't speak English. Apparently, born in country, but spent most of his young life in France. Out of his 10 years as monarch, he spent only six months in England. That's why some folks call him "the absent king." Because he was a great military leader, he was supposedly called Lionheart (Cœur de Lion) before he ascended to the throne. And, more people supposedly know him as the Richard the Lionheart, rather than as Richard I. He fought with the Knights Templar by his side. He supposedly winked at the crossbowman who had him in his sights, just before getting hit. He was forgiving. He forgave his brother, John, who all but usurped the throne while Rick was off saving the Christian world. He even forgave the crossbowman for killing him. No one knows how tall he was - apparently, because his remains have been lost for generations. Annnnd, I'm failing to understand this one - his body parts were buried all over hill and dale - his brain in Poitou, his heart in Rouen and the rest of his body, they buried at his father's feet in Anjou. Eh, not bad for a quick, beat the clock magnetpost, huh. BBC's Did Robin Hood Ever Meet King Richard? Yay for an RA shoutout. But Timothy Dalton wasn't his brother! Unless you count the fact that Richard's half-sister was also Timothy's (character's) half-sister, thus making them somehow oddly related (and yet not). Sorry. You know I can't resist a good bit of British history. Good call, glor. And good point! Maybe I was picking up on the ho-yay? Hee. I had you in mind when I wrote this quickly last night - I was like OMG, I have to get this right, cuz glor will be sad if I don't. Hehehe. I think you were definitely picking up on the ho-yay. As I recall, there was much of it. I am bouncing in anticipation of a Richard III post. I even have a RIII magnet! But RA! And Timothy Dalton! And Lion in Winter!! We should do a Richard III simulpost!!!!!!!!!! Somehow. I would have to get a Richard III movie. But OMG!! Yup, let the geekout begin. Hahahaah. We should! Here's my worry though. I tried earlier this week to watch Olivier's RIII...and couldn't do it. I think it was because I was trying to do it while doing other things. Maybe if I concentrate. Hee. Also, no worries - I did the same thing - when I read the Lionheart crowning thing, I was ready to post the RIII magnet. Good thing I made myself wait til I got home! The RA shout-out was a must, because I love that Pudsey scene. And, I actually looked up the Robin/Guy/Lionheart episode to link to, but it's not online. On YT, that is. I have to say that Olivier's RIII comes across to me as a bit... campy. Much in the same way as his Henry V does. It's not my favorite in the RIII oeuvre. I am going to watch Looking for Richard this weekend, which is half RIII performance and half documentary on understanding RIII.